Under the wings of the Swaajp School of Improv you can find full courses in improvisational theatre as well as one-off workshops. These are taught by the performers of Swaajp or by professional – often international – guest teachers. All our activities are listed in the calendar at the bottom of this page. Take your first steps in improvisational theatre with us! Both people with and without acting experience are welcome to explore what an empty stage can turn into, using just your own imagination. You will rediscover your natural spontaneity by going outside of your comfort zone and surprise yourself with the splendid outcome. Participants will get to know the principles of improvisation, and explore them in improv games and exercises focusing on characters, emotions, decor, and story. 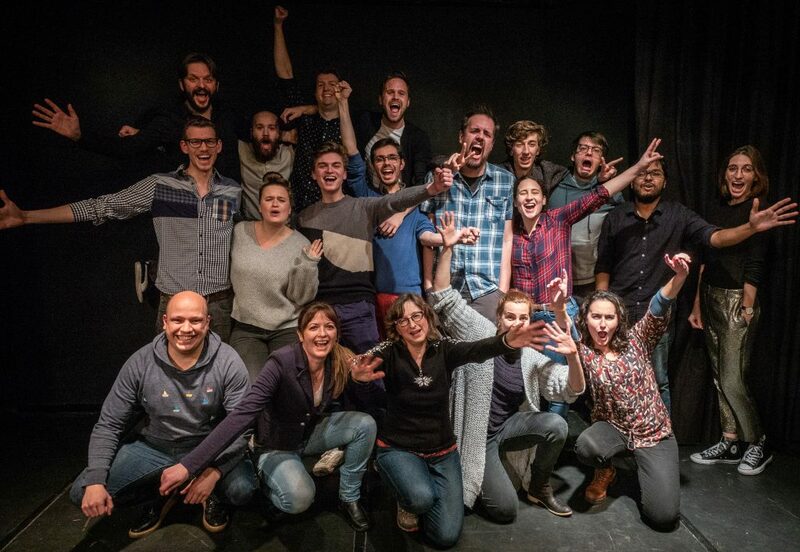 Our school of improvisation is recommended for people who want to play theatre but are too creative to follow the lines written by others, people who want to improve their public speaking, and definitely people who want to have a lot of fun! …are an improviser with experience in longform wishing to take your longform skills to the next level of awesomeness! How can we create longform that is fun, captivating, varied, deep, highly entertaining, funny and that the audience loves as much as we do? The clear answer is: by putting more nutella on our breads. „The Nutella Technique“ is a 6 hours intensive workshop in which you will learn to instantly improve your longform formats – whether they be narrative, montage or American-style longforms. We will focus on finding the fun in improvising longer pieces – both for the players as well as the audience. The workshop gives you a simple yet effective tool to take home to your ensemble and to immediately apply to all of your formats. Participation fee: €75 for 6h of workshop, including lunch. Previous improv experience (including some longform) is required. Claudia Behlendorf is a well-known German improviser, trainer and actress. She regularly performs with the ensemble „Die Affirmative“ and the trio „Mugshot“ and works as a tv actress on German public television. She is the artistic director of „Die Affirmative“, head of the Mainz School of Improv and organises one of Germany’s best-known festivals for improvised theatre, „Punk and Pomp“ in Mainz. 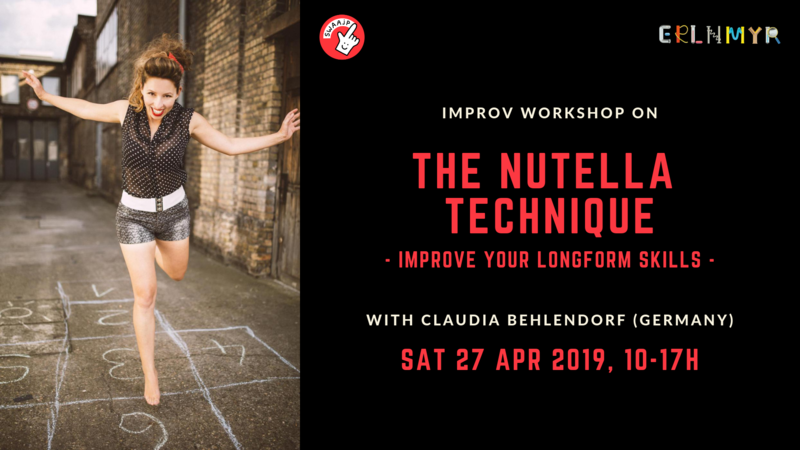 Claudia has taught and performed all over Germany as well as internationally e.g 2018 at Improfest Ireland, at the Finland International Improv Festival and at „Subito“ in Brest, France. She won several prizes, inter alia the Maestro in The Hague and in Würzburg and has worked and studied intensively with iconic teachers of the improv cosmos such as Keith Johnstone, Shawn Kinley, Jay Sukow and Inbal Lori. In life, some of the most profound, moving or hilarious experiences play out in total silence. In this workshop, we will learn to lean on that familiar human state- silence- on the stage, discovering it’s unique theatrical power. This workshop is not directed towards mime, or even necessarily physicality, but rather the dramatic and comedic impact of not speaking, and all the actions, realisations and stories that rush in to fill space when we’re brave enough to leave it empty. During the workshop we will cycle through the myriad of ways silence can be utilised to make offers, ground scenes, heighten emotions, develop game and connect with the audience. Participation fee: €35 for 3h of workshop. Basic improv experience is required. 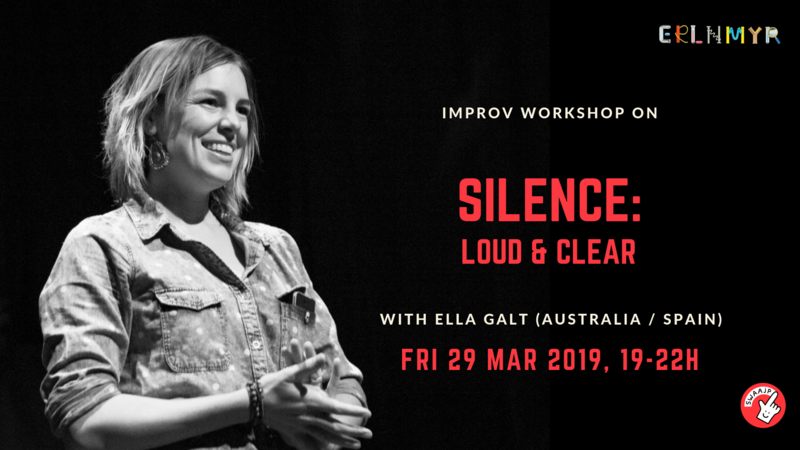 Ella Galt is an Australian actress and improviser who has been studying, performing and teaching theatre for over 12 years. She earned a B.A. in Theatre Studies at Monash University, Melbourne and her performance experience ranges from improvised and musical theatre to voice, theatre in education and dance. Since joining Barcelona Improv Group (BIG) in 2012 she has trained with some of the most renowned improv teachers and coaches in the world and has studied and performed in festivals around Europe. Ella co-runs the BIG School of Improv, where she co-designed a unique curriculum to train committed, joyful and well-rounded improvisers. She teaches students of all levels in weekly classes, emboldening beginners and experienced improvisers alike to produce rich, vibrant and committed improv. Her improvisation style centres around bold, emotional, committed play and uses the full extent of her theatrical background, implicating the body and voice to create scenes and shows that are dynamic and filled with joyful imagination and play. Her teaching style is energetic and supportive, and aims to unleash the unique potential of every improviser and scene. Registration will open before the summer. This course is mostly for students that previously finished the Swaajp beginner course in improv theater. Contact us first if you wish to register without having previous experience at the Swaajp School of Improv. 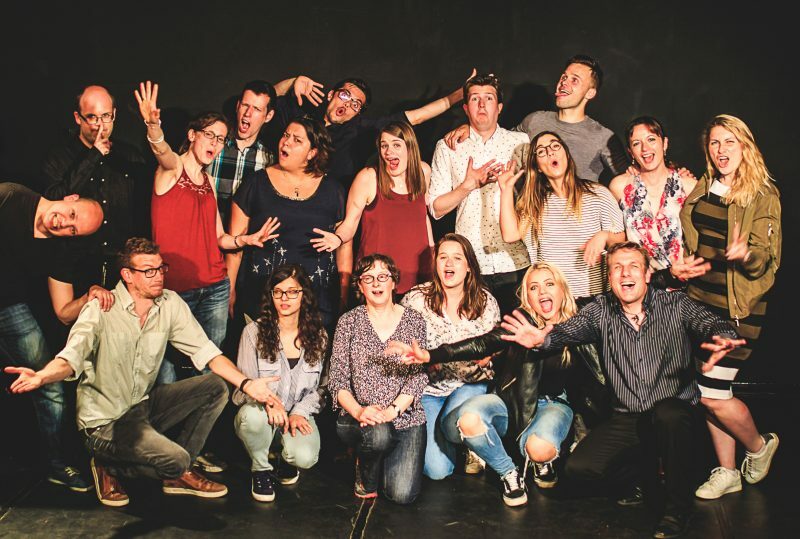 This course will let you take your first steps into improvisation theatre. Both people with and without acting experience are welcome to explore what an empty stage can turn into, using just your own imagination. You will rediscover your natural spontaneity by going outside of your comfort zone and surprise yourself with the splendid outcome. Participants will get to know the principles of improvisation, and explore them in improv games and exercises focusing on characters, emotions, decor, and story. This course is recommended for people who want to play theatre but are too creative to follow the lines written by others, people who want to improve their public speaking, and definitely people who want to have a lot of fun!